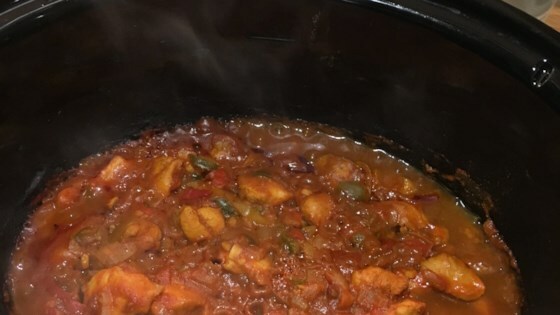 "This is a really simple chicken jalfrezi recipe that comes out beautifully in the slow cooker without much prep. You can make it as spicy as you want - although jalfrezi is normally medium spicy. Just put all the ingredients in the slow cooker and enjoy the smells throughout the house!" Dust chicken with flour in a bowl. Heat oil in a large skillet and cook chicken pieces until lightly browned, about 5 minutes. Place in a slow cooker. Add tomato sauce, onion, bell pepper, green chile peppers, red chile peppers, curry powder, garam masala, coriander, cumin, garlic, and chile powder. Stir to combine. Cook on Low until chicken is no longer pink at the center, about 6 hours. See how to make zesty barbequed chicken in your slow cooker. You can also use 1 to 2 red bell peppers instead of green bell peppers. You can skip the browning of the chicken. I feel that when I am putting everything in the slow cooker at the same time, it gives the ingredients almost a marinating time. If the sauce is too thin at the end of the cook time, add some cornstarch until it is the thickness that suits you. If you don't have or can't get fresh chiles, I have used dried chiles and it is still very nice.